Don’t let the name fool you. 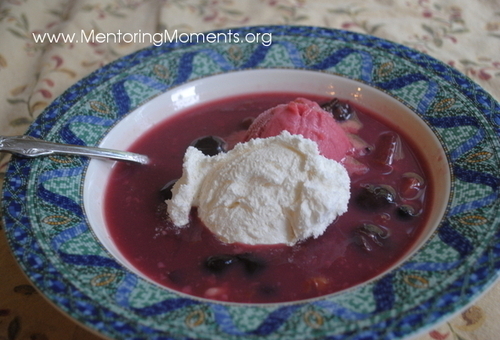 It may be called soup but it’s all dessert–and a great one for nippy fall evenings. Top with vanilla ice cream, sherbet or whipped cream and enjoy! Put cherries, water, cinnamon, cloves, sugar, extracts and nutmeg in a large pan. Bring to a boil. Allow soup to boil for 2 minutes, then reduce heat, simmering for another 15 to 20 minutes. Remove from heat and allow to cool slightly. When soup has cooled, mix milk into pudding in a separate bowl. Slowly add pudding mixture into the soup, stirring constantly. Take care that the soup is not too hot or the pudding will become lumpy or curdled looking. Serve warm or chilled as an appetizer or dessert. VARIATION: Substitute other single or mixed fruit varieties, according to what is in season. Adjust spices as desired.